Planet Without Apes demands that we consider whether we can live with the consequences of wiping our closest relatives off the face of the Earth. 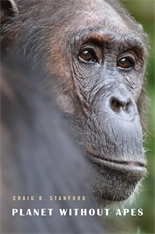 Leading primatologist Craig Stanford warns that extinction of the great apes—chimpanzees, bonobos, gorillas, and orangutans—threatens to become a reality within just a few human generations. We are on the verge of losing the last links to our evolutionary past, and to all the biological knowledge about ourselves that would die along with them. The crisis we face is tantamount to standing aside while our last extended family members vanish from the planet. Stanford sees great apes as not only intelligent but also possessed of a culture: both toolmakers and social beings capable of passing cultural knowledge down through generations. Compelled by his field research to take up the cause of conservation, he is unequivocal about where responsibility for extinction of these species lies. Our extermination campaign against the great apes has been as brutal as the genocide we have long practiced on one another. Stanford shows how complicity is shared by people far removed from apes’ shrinking habitats. We learn about extinction’s complex links with cell phones, European meat eaters, and ecotourism, along with the effects of Ebola virus, poverty, and political instability. Even the most environmentally concerned observers are unaware of many specific threats faced by great apes. Stanford fills us in, and then tells us how we can redirect the course of an otherwise bleak future.